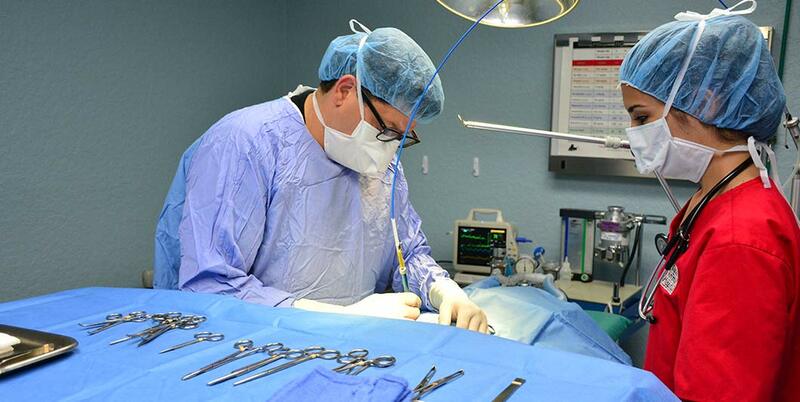 At Jupiter Animal Hospital, we offer full surgical services for your dog or cat. Each patient is carefully screened prior to surgery and anesthetics are specifically tailored to them. We recommend pre-surgical blood work so we can evaluate your pet’s kidney, liver and heart function prior to undergoing anesthesia. When possible, we use a top-of-the-line laser during our surgical procedures. Prior to surgery, we will ensure your pet is an acceptable candidate to undergo anesthesia by doing a thorough physical exam with pre-surgical diagnostic texts. During surgery, your pet is closely monitored by a knowledgeable, well-trained technician who is also aided by digital monitoring equipment. IV fluid therapy and thermoregulation is provided for all surgical patients. Comprehensive pain management is utilized before, during and after your pet’s surgical procedure to keep them as comfortable as possible. Our health care team members offer individual, compassionate pre and post surgical care to each and every patient. We will always communicate with you after surgery to keep you fully informed about your pet’s surgery, progress and recovery. Please ask a technician or veterinarian if you have any questions regarding your pet or their surgery.